Creamed Peas and Potatoes are a classic southern side dish. This recipe is a little different in that it has Velveeta cheese melted into the creamy sauce . 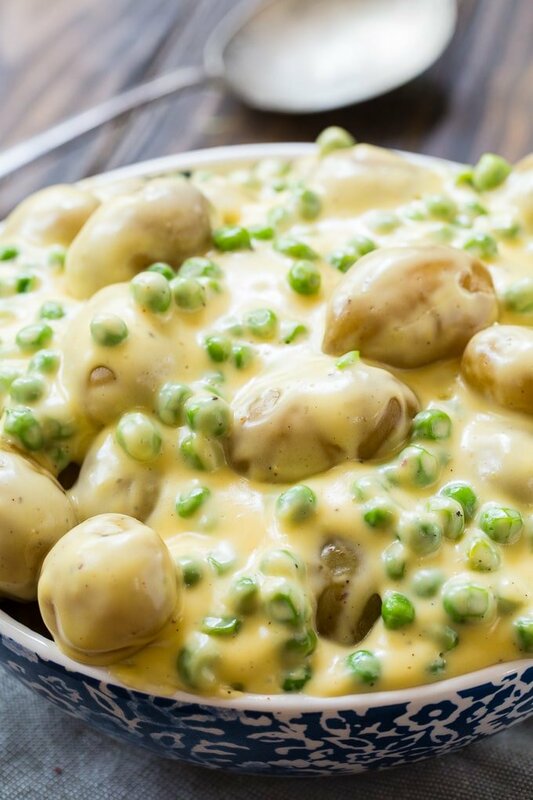 Cheesy Creamed Peas and Potatoes are so creamy and cheesy even your kids will love them. This side dish is pure comfort food! This is a recipe I adapted slightly from the blog Sweet Tea and Cornbread. It’s a totally delicious way to eat new potatoes and peas together. 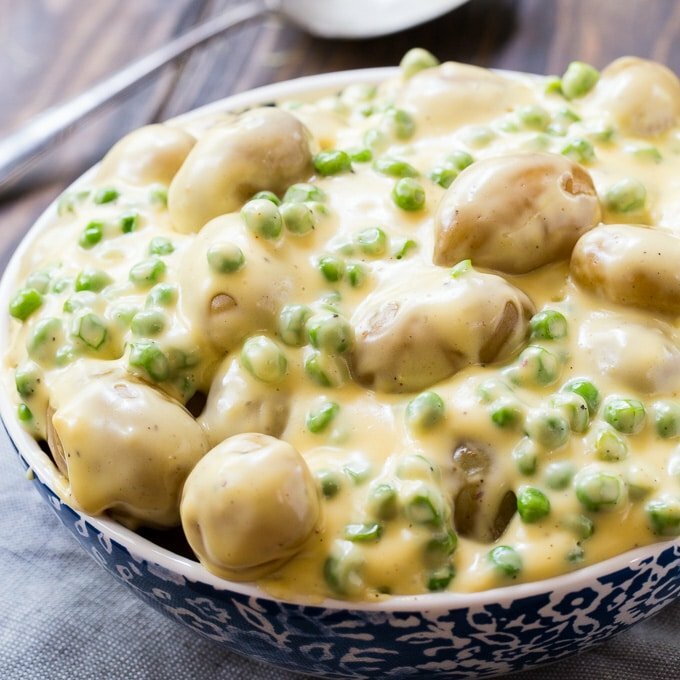 Creamed Peas and Potatoes is a dish I’ve eaten many times, but I never thought to add cheese. Southerners are the best at turning vegetables into comfort food. This dish is lick your fingers good! 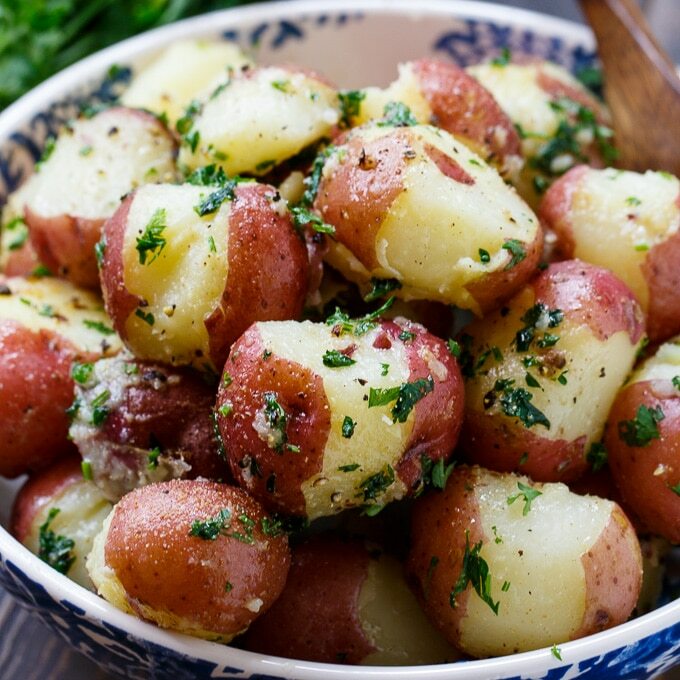 To make this recipe, look for those little tiny new potatoes that are almost bite-sized. That way you don’t have to cut them. If you have to use larger ones, cut them in half or in quarters. If you like canned peas, you can use them but don’t add them to the boiling water with the potatoes. Just stir them in at the end. 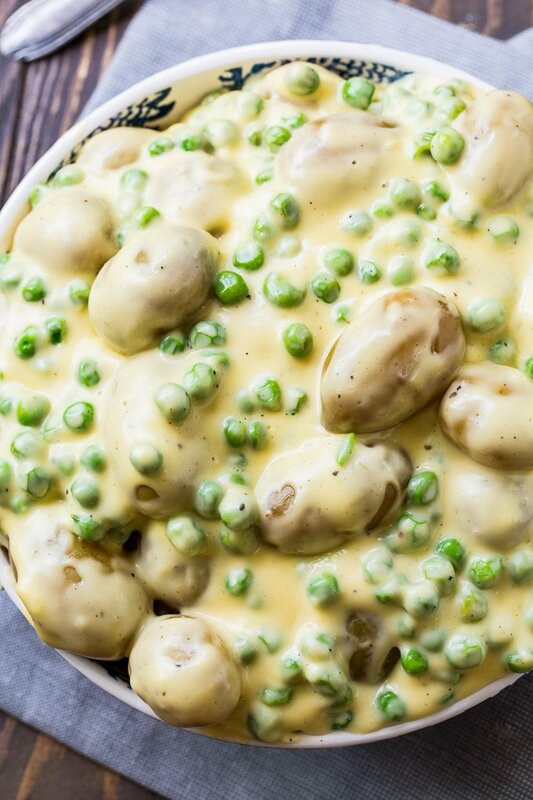 Cheesy Creamed Potatoes and Peas is at the top of my list of favorite side dish comfort foods! 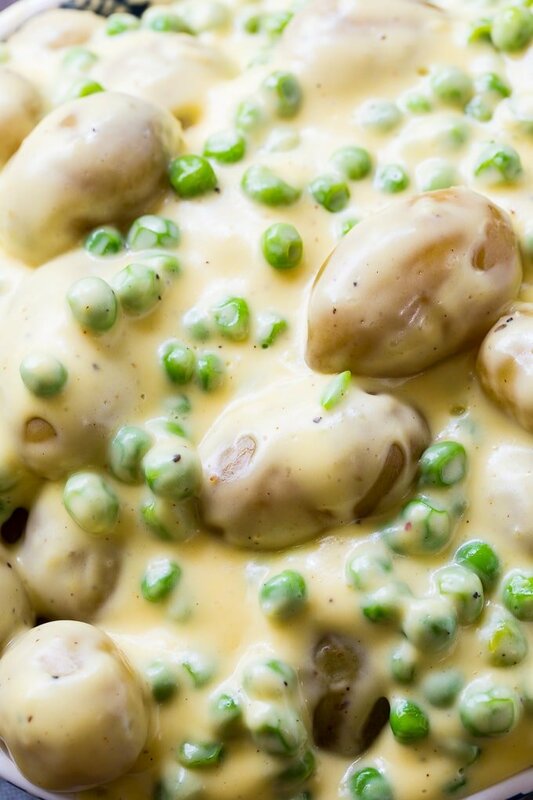 Creamed Peas and Potatoes are a classic southern side dish. This recipe is a little different in that it has Velveeta cheese melted into the creamy sauce . Place potatoes in a dutch oven or large saucepan. Add water to cover by about an inch. Add 1 teaspoon salt to water. Bring water to a boil and simmer until potatoes are just starting to get tender, about 15 minutes. Add peas and simmer 5 more minutes. Drain and set aside. Add butter to the now empty Dutch oven or saucepan and place over medium heat. Sprinkle flour into pan and whisk it into the butter for 1 minute. Add seasoned salt and pepper. Cook and stir until thickened, about 1 to 2 minutes. Remove from heat and add Velveeta. Stir until melted. Return potatoes and peas to pan and mix them into the sauce. 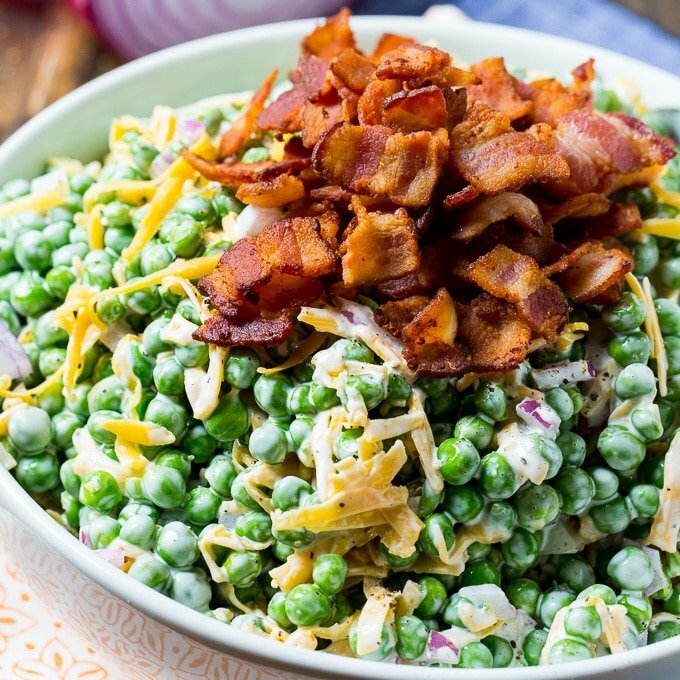 This entry was posted in Side Dishes and tagged peas, potatoes. Bookmark the permalink. i have been making this for years, and i love it. Sometimes i like to make it a one pot meal and add some chopped up dried beef to it and have it over biscuits or toast. This looks perfect for breakfast! How long can I keep it in the fridge? Thank you! I don’t think I would keep it longer than 3 days.